Wow! 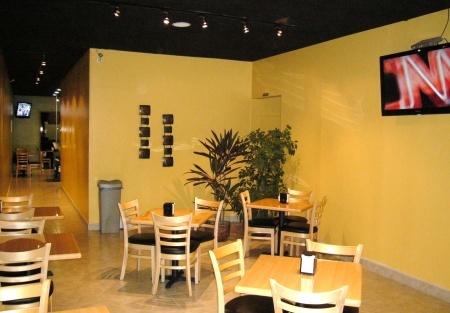 Base Rent Just Reduced by 40% for this Great Looking 6 Day Sandwich Shop. Selling Restaurants presents this well appointed and nearly new sandwich shop located in the heart of South Orange County surrounded by affluent neighborhoods, businesses and retail centers providing heavy traffic flows. The base rent was just reduced by 40% which is effective for 6 months(until approxiamately the end of August 2009). The new base rent is $1,675 with monthly CAM charges of $831. Total monthly rent is only $2,506. That's only $1.58 per square foot. A HUGE savings. Take advantage of this reduction. In addition the restaurant is clean and professionally appointed and is perfect for your new concept or continue with the existing menu. It currently features a menu consisting of hot/cold sandwiches, subs, specialty sandwiches, combo meals, salads, and some popular South American flavor in addition to a beer and wine license. The current owner remodeled this beautiful restaurant in 2008. This business focuses on the lunch business in the surrounding area and a new owner could grow the business by promoting dinner service. The landlord has already approved any upgrades for the installation of a hood system, grill, and grease interceptor system for any concept that the new buyer may need. Expand the shop into a sports venue deli concept as there are two dinning areas. There is plenty of seating and plasma t.v's already connected to satellite for the sports games. If you brought a happy hour with discounted appetizers and more the evening and dinner rush would bring tremendous opportunity and potential. This is a very simplistic concept with ease of operation and just right for the buyer who wants a smaller restaurant with great demographics and one that can easily turn into a cash cow with patience and good planning. Take a look today. Ask the agent for financial data, leasing information and for the restaurant's website address. Take the next step and go to sellingrestaurants and select one of the bright orange buttons below the listing. Then select the "New registration" Button. When you register, you get the name, address and pictures right on-line - no paper or faxes - you'll also get priority notification of our new listings in the future, prior to the general public, giving you the best chance to �scoop in� the best opportunities. There are also more photos available to our registered buyers. Great Location Surrounded by Affluence. Solid Demographics with high Income Levels.